Kim Kardashian has been "angry" with her husband Kanye West. The 37-year-old beauty was far from a thriller when the rapper announced, during an Open Mike session with Chance The Rapper, that he would return to his hometown, Chicago, according to The Sun. 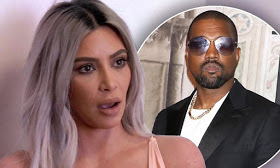 "She has never lived anywhere other than LA, and she's upset that Kanye says things like this publicly when they have not even talked about moving in. She told him it was not happening," the source said. The friend added that they have invested so much in living in Hidden Hills, California, near her mother. "They have spent millions renovating their home in Los Angeles and are too tired to think about moving again," he added.